Federal funding • Local economies would take a big hit if funding is allowed to expire in summer. PILT funding by county Each of Utah's 29 counties get at least some money from the federal government to compensate for the public Al Hartmann | The Salt Lake Tribune In this file photo, cattle graze on public land in Utah. PILT funding by county Each of Utah's 29 counties get at least some money from the federal government to compensate for the public lands in their boundaries that eat into their tax base. 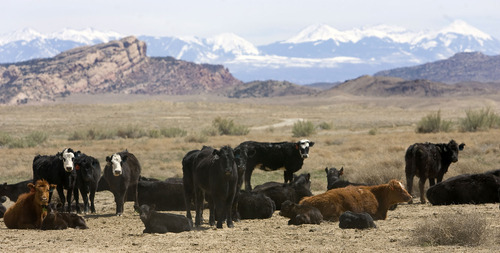 Al Hartmann | The Salt Lake Tribune In this file photo, cattle graze on public land in Utah. Washington • Congress&apos; broad new spending plan includes no cash to compensate rural counties with federal lands, leaving Western lawmakers scrambling to save the long-standing program before the money dries up in June. The payment-in-lieu-of-taxes program, known as PILT, annually divvies up more than $400 million among counties that have some public lands, the argument being those lands leave communities with a diminished tax base. Every state but Rhode Island gets some of the money. 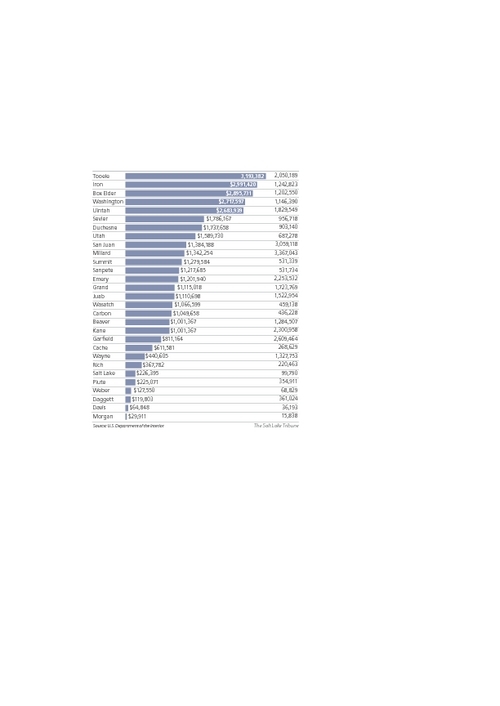 Utah received $35.4 million in PILT funding in 2013, second most in the nation behind only California. But bipartisan budget negotiators left PILT out of the $1.1 trillion spending plan that Congress is trying to pass by the end of the week. The House is expected to vote on that plan Wednesday, leaving little chance that the PILT money will be restored in this legislation. Instead, Congress may add it to a farm bill later this month. "Oh boy," said Kane County Commissioner Jim Matson when told Tuesday his county may get zilch from the program. PILT makes up a little more than $1 million of the county&apos;s $7.9 million budget and the loss could have a big impact. Some 90 percent of the county is federal land. "If it becomes permanent, eventually we&apos;d have to restructure all of Kane County governance," Matson said, noting the county provides law enforcement and emergency services to the public lands when needed. "Doggone it if we&apos;re unable to [provide law enforcement services] because of a reduction in PILT, then the feds get to have it, and we have no confidence in that." Utah Gov. Gary Herbert, in Washington on Tuesday, said he spoke directly to President Barack Obama about the lack of PILT funding and how it impacts Western states. "The fact that that&apos;s not in the budget is a little bit disconcerting," Herbert, a former county commissioner, said. The bipartisan budget announced Monday funds the government through October and reduces discretionary spending to its lowest level since the end of President George W. Bush&apos;s administration. It also alleviates the pain from across-the-board cuts to the military and social service programs because of sequestration. The budget bill does fund two Utah priorities, the Central Utah Project  bringing water to the populous Wasatch Front  which President Barack Obama has tried to slash, and the ongoing effort to remove uranium tailings from near the Colorado River in Moab. Pushing PILT • Rep. Rob Bishop, R-Utah, and other members of the state&apos;s federal delegation are leaning on Republican House leaders to guarantee PILT funding will be restored, most likely in a farm bill that is expected to come up for another vote later this month. If PILT is included in the farm bill, it could be funded for as long as five years. Congress has failed repeatedly to get a farm bill through the House, leaving Bishop a little nervous. House leaders worked to assuage the fears of Bishop and Utah Reps. Jason Chaffetz and Chris Stewart among other western Republicans in a meeting Tuesday afternoon. Stewart, Chaffetz and others left confident that PILT will be funded in the immediate future. Bishop was surprised the budget bill didn&apos;t take care of this issue, because its exclusion was enough for western lawmakers to threaten to vote against the broader bill. "Any state with significant federal lands is greatly affected by this," said Chaffetz. "Leadership is assuring us that there is a solution." The budget was drafted by the House and Senate appropriation committees. Stewart, a freshman, is a newly appointed member of the appropriations panel and didn&apos;t have a chance to influence the budget. Bishop said having Stewart on the committee should help protect PILT in years to come. Utah&apos;s cut • PILT funding, which began in the late 1970s, is based on population and the number of acres of public lands. In Utah, all 29 counties get at least some of that money, with Tooele County getting the biggest share at $3.2 million, followed by Iron County ($3 million) and Washington County ($2.7 million). Salt Lake County, the state&apos;s most populous, received just $226,000 in PILT funding. Congress used emergency funding to boost PILT payments after the 2007 recession and guaranteed the funds for five years. In 2013, Congress signed off on a one-year deal, leaving Congress to find a new funding source for the program in the years to come. Outside Utah, the National Association of Counties raised concerns that zero PILT funding would severely hurt rural areas that rely on the annual payments. "We are deeply concerned that Congress would turn its back on more than 1,850 counties impacted by the presence of the U.S. government&apos;s extensive holdings of public land," said Matt Chase, executive director of the association. "Since October, counties have in good faith delivered vital county services to our citizens and visitors with the expectation that the federal government would honor its 37-year commitment to county governments who are unable to collect property taxes on more than 600 million acres of federal land."  Thomas Burr contributed to this story.